I spent most of the day of the wedding with family, at the ceremony itself and at the party afterwards. I really love weddings, and this one was especially good. Family, food, drinks, maybe even made a few new friends. I did manage to cajole my parents into eating at an Ethiopian restaurant for lunch earlier that day. The experience is probably just as important as the meal itself. Everyone sits and crowds around a low, small table that resembles a drum. A single platter of various foods is laid out, and a bread is distributed with which to dip into and pick up the assorted sauces and meats. The bread is probably the most distinctive part of the meal. Its like nothing I've ever seen. Injera, as the Ethiopians call it, is a sort of crepe like consistency. When they brought it out, my mom thought that they were hand towels. Very unique. Floppy and thin. The next day we got up bright and early. We put our sightseeing gamefaces on, and drove into the middle of the b east that is downtown Washington, DC. 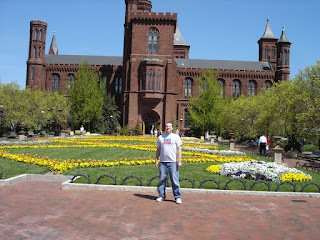 In case anyone is thinking about visiting DC, I will warn you, nay, implore you. Don't drive a car in DC. Take the bus, or the metro, or a taxi. The traffic in DC is some of the worst that I have witnessed on this earth. Post 9-11 security measures mean that large swathes of perfectly good streets are barricaded with numerous blocks of concrete. That cuts down on the available places to stop and cry when you can't find parking. Next comes the layout of the streets themselves. There is the usual grid of streets that the sane person can accept. Then, there's the diagonal streets that just cut through this framework for seemingly no reason. Then add in a sprinkle of circle drives. Next several bridges cross the river to bottleneck everything that might want to move. Keep in mind that back when these streets were named, J and I were pretty much the same letter, so don't bother looking for anything between I and K streets, because you will find only heartbreak. Mix this all together and you will understand why the president travels by helicopter. So fast forward through the cursing, and aimless driving, and screaming at the map. Once on foot, we saw all kinds of wonders. A whole long line of Smithsonians are laid out for the visitor. Even mildly discovering these museums would easily take a wee k of ones time. The National Air and Space Museum is especially excellent. The world's most visited museum holds everything from the Wright Flyer to the craft from the Apollo missions. I enjoy IMAX movies, and try to see them whenever the opportunity presents itself. Here I saw Magnificent Desolation, a movie about the moon and the men that have been there, narrated by Tom Hanks, who is totally dreamy. After I finished my space ice cream, we all continued on. Next we visited the National Postal Museum. I have been a bit of a stamp nerd at various times in my life, so this museum was a kind of interesting to me that others might not share. I still learned plenty of thing about the postal service that many people might take for granted. The museum was very interactive and interesting. 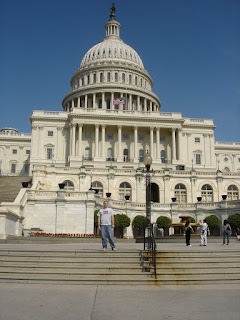 A quick visit to the exterior of the Capitol building was followed by a visit to the interior of the Washington Monument, which had a great view of the surroundings. If you look closely, you can see where the color of the stones in the monument abruptly change. The construction of the monument was halted for a time due to lack of funds and the Civil War. When building resumed, the original stone was no longer available. We managed to get tickets to see a tour of the Bureau of Engraving and Printing. It wasn't as cool as you might think. No photography was allowed, and all of the machines were chugging away behind several glass windows. I much preferred visiting the Jelly Belly factory in California. Now that was fun. A humorous sign pointed out that the workers present were creating more money in an hour than they would ever earn in their lives. God Bless America. Ford's Theater is conveniently located across the street from the house where Lincoln died, for obvious reasons. It was more of an excuse to sell crap than a legitimate museum though, and I advise the casual traveler to give it a pass. The plane ride home was unexpectedly eventful. Due to a lucky alignment of the stars, the direct flight between Dulles and Springfield Capitol Airport began the day that we returned home. Mayor Tim Davlin and a small delegation were on the flight, having just thanked Senator Durbin for the grant necessary to begin the non-stop service. When we walked into the Springfield Airport, a large group of people were there celebrating the first flight. There was free food and beer for everyone. We even got some nice stone coasters commemorating the occasion. Hurray. Best flight ever!